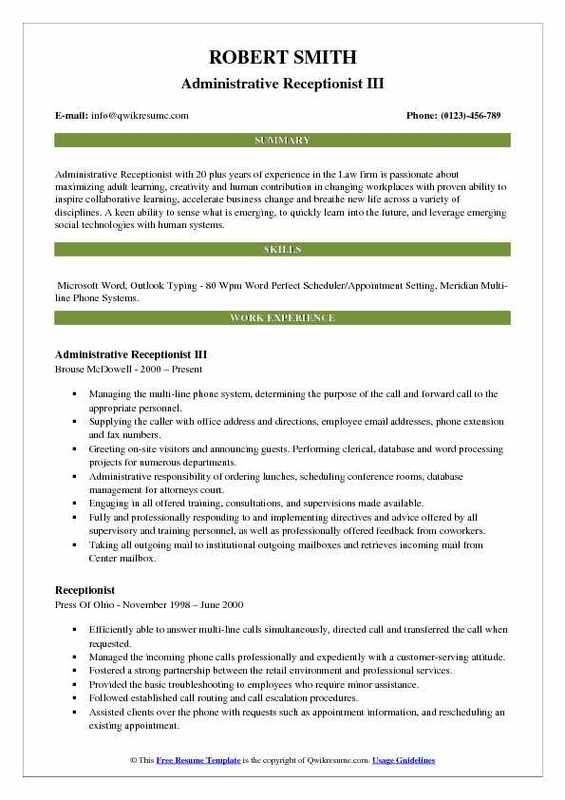 Administrative Receptionist Resume is the first body of interaction for a company. The roles and responsibilities underlined in the job description template are preparing internal and external reports for directors, providing support to management staff and maintaining document libraries. The individual also schedules meetings, books conference rooms, records minutes of the meetings and raises different agendas. The responsibilities highlighted in the job description template are performing budget entry, preparing onboard activities for employees and helping in other clerical support. 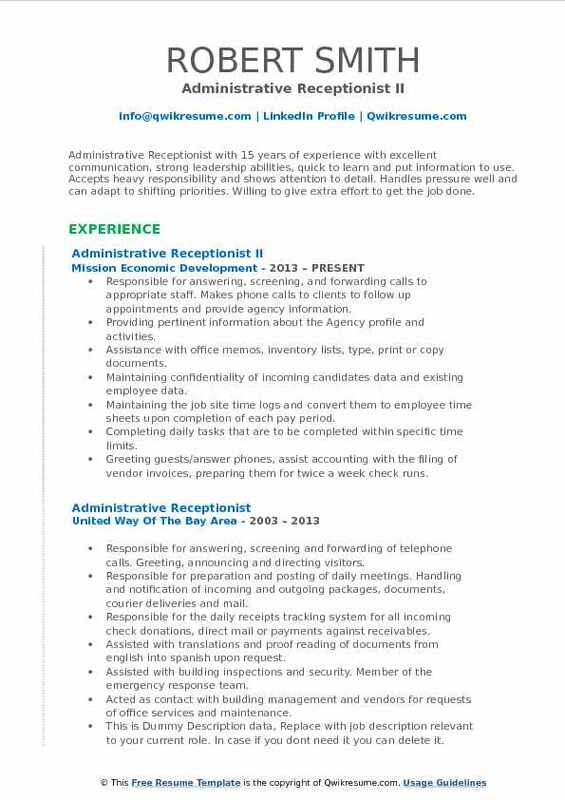 The main function of an administrative receptionist is to answer all calls. The skills required are good typing skills, effective communication skills, proficiency in office software, familiarity with all department functions and proper knowledge of office practices. The educational qualification required is associated degree in related field or equivalent. Experience using software packages and relevant office work is an added advantage. 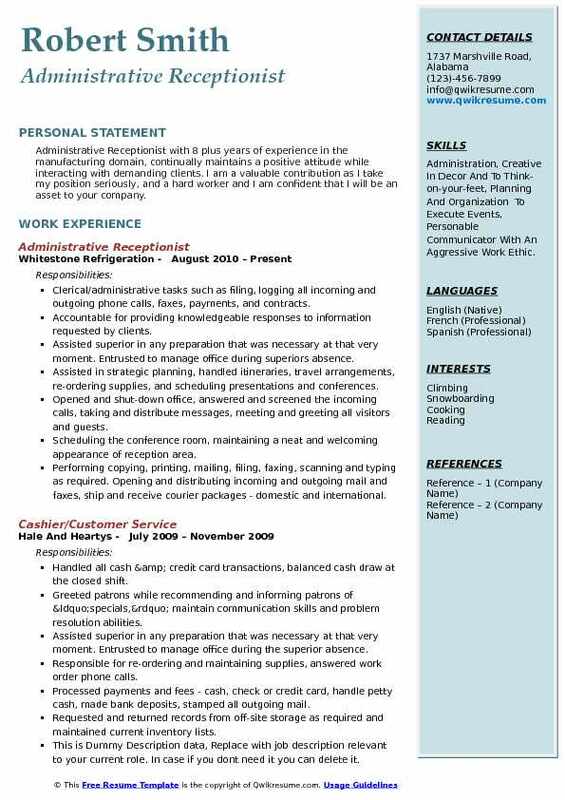 Objective : With over 2 years of administrative experience as an Administrative Receptionist and taking great pride in being the face and voice of a company, being able to multitask in the following; maintaining and updating calendars and arranging travel; coordinating conferences, meetings, and special events; greeting clients with great poise over phone and in person, answering their inquiries or relaying messages accordingly. Answered all incoming calls and directed to the appropriate parties via voicemail or handwritten messages. Date stamped, scanned, uploaded and billed accordingly into appropriate client files all incoming faxes into client profile legal programming daily. Greeted the clients as they come in for appointments with the attorneys, announced their presence and escorted the clients as needed. Coordinated and communicated with various doctors offices and hospitals to request medical records and medical billing of clients for the firm. Created correspondence to request medical records and medical billing of clients for the firm utilizing Word Perfect template. Occasionally, coordinated and communicated with clients to gather pertinent information pertaining to their case. Date stamped, scanned, uploaded, renamed pdf file and billed accordingly into each appropriate client file(s) all incoming daily mail utilizing client profiles legal programming. Printed postage, recorded postage amounts on all outgoing client mail and drop off at the post office along with prepared FedEx daily. Copied Westlaw and bar journal excerpts used for client legal research as needed for attorneys. Filed all legal documents into appropriate sections of each clients legal hard file. Input monthly client copier accounts into client profiles legal programming. Objective : A dedicated individual with a broad range of 3 plus years of experience in the Construction Domain. 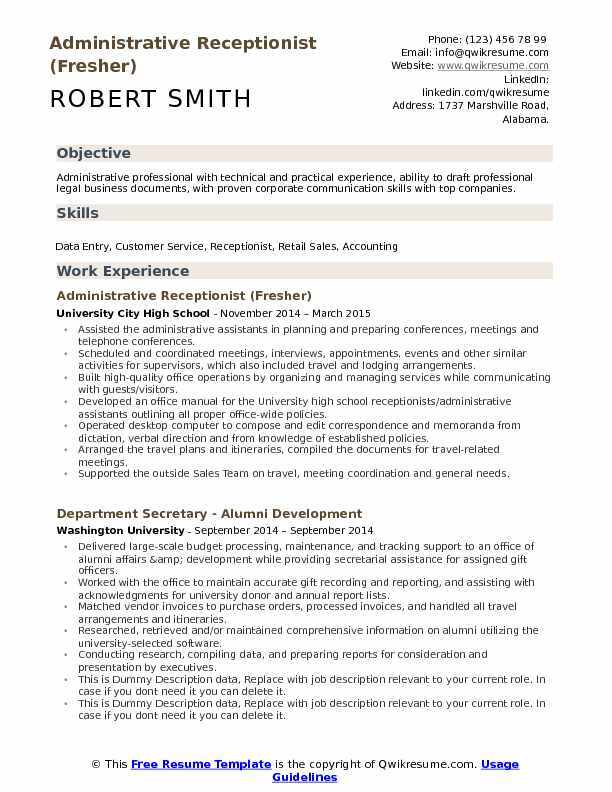 Ability to multi-task, with strong verbal and written communication skills, along with strong organizational skills, self- motivated, time management skills, can meet deadlines without compromising quality, positive attitude, problem solver, the ability to adapt to change easily, and the ability to maintain confidentiality. Skills : Cisco, Deltek, Excel, Microsoft Office Word, Excel, PowerPoint And Lync, Skype. Answered, screened and routed all incoming calls, recorded detailed messages, gave detailed information. Received all visitors, clients, and walk-ins at the reception area and prepared memos. Prepared correspondence, reports, and other tasks when necessary received and sorted daily mail delivered orders; oversaw office equipment and fleet maintenance by coordinating preventive maintenance and called for repairs; coordinated office events and meetings and maintained the official records. Provided the basic HR support to the staff, including serving as a liaison to HR contact; coordinated and streamlined the staff onboarding process, including basic training of systems and induction. Coordinated the purchase and maintenance of office equipment, assisted with the timesheets. Coordinated with building maintenance staff and service vendors, provided basic IT support to staff, including serving as a liaison to IT contact. Completed expense reports for the Senior Vice President and assisted the staff with administrative tasks. 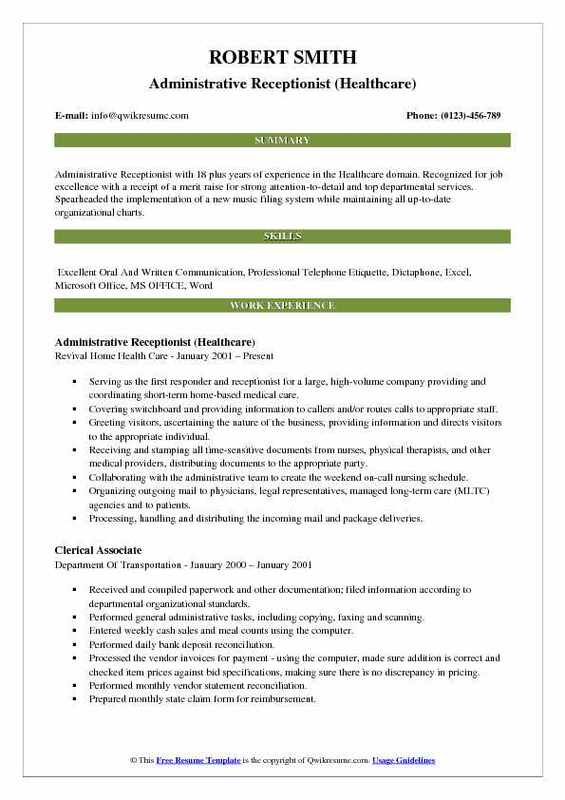 Summary : Administrative Receptionist with 18 plus years of experience in the Healthcare domain. Recognized for job excellence with a receipt of a merit raise for strong attention-to-detail and top departmental services. Spearheaded the implementation of a new music filing system while maintaining all up-to-date organizational charts. 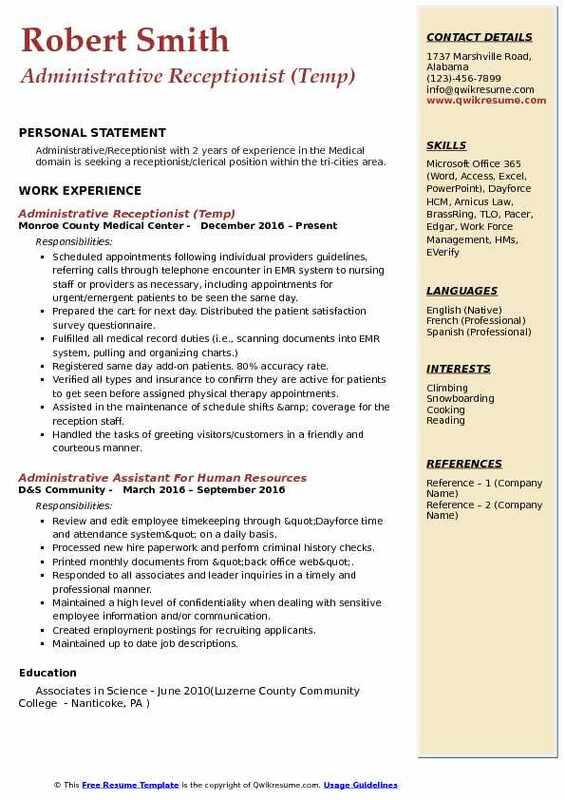 Serving as the first responder and receptionist for a large, high-volume company providing and coordinating short-term home-based medical care. Covering switchboard and providing information to callers and/or routes calls to appropriate staff. Greeting visitors, ascertaining the nature of the business, providing information and directs visitors to the appropriate individual. Receiving and stamping all time-sensitive documents from nurses, physical therapists, and other medical providers, distributing documents to the appropriate party. Collaborating with the administrative team to create the weekend on-call nursing schedule. Organizing outgoing mail to physicians, legal representatives, managed long-term care (MLTC) agencies and to patients. Processing, handling and distributing the incoming mail and package deliveries. Distributing necessary medical supplies to nurses and physical therapists, managing inventory and places orders for supply replenishment when needed. 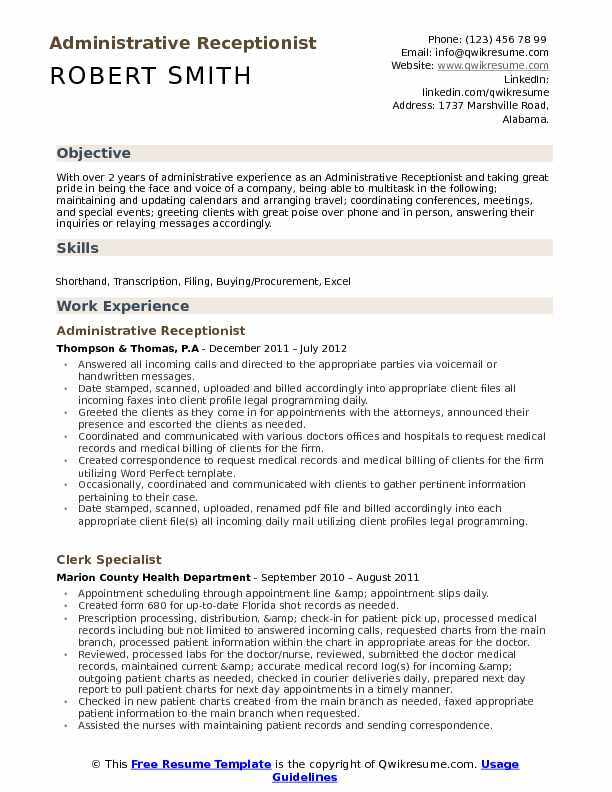 Summary : Detail oriented, organized, creative, and problem-solving Administrative Receptionist with 9 combined years of experience in the Non Profit and the Healthcare domain. Over the course of my work history I have worn many hats and have learned all angles of customer service/business management. My strengths are multitasking, quick-learning, going above and beyond my job description, and ensuring customers have the best experience no matter their need. Administrative support to all programs: administration, child care, domestic violence and sexual assault, and shelter. Responsible for coordinating with the superintendent the completion of daily reports, equipment reports, and schedule updates. Assisted the accounting department with various accounting functions. Objective : Administrative Receptionist with 3 plus years of experience in the Hospitality domain with the demonstrated ability to deliver results in a fast-paced, multi-million dollar, commercial environment. Strong work ethic, Proven effective manager of people and capable of achieving the most with an ability to develop teams through effective training and training plans; Excellent organizational and coaching skills; Thorough and comprehensive range of administration, commercial, and training skills. Greeting guests as they arrive, confirming that they have a prior booking and managing their registration process. Handling guests check-ins / check-outs appropriately, handling the room keys and confirming that they are satisfied with the room. Operating the hotel switchboard, taking calls, providing information and transferring the calls. Taking reservations over the telephone, through emails and in person using the Opera system. Answering queries regarding hotel services, charges, facilities and giving directions by phone, emails or in person. Contacting the housekeeping and maintenance departments when a problem is reported. Managing the accurate accounting of all rooms, computing the bills and taking payments. Balancing the cash at end of my shift and generating accounting reports for the benefit of the next shift. Transmitting the information or documents using computer, mail, email or facsimile machine. Preparing and distributing the monthly employee newsletter. Assisting the Human Resources with data entry, packet assembly, filing, and completion of new hire paperwork. 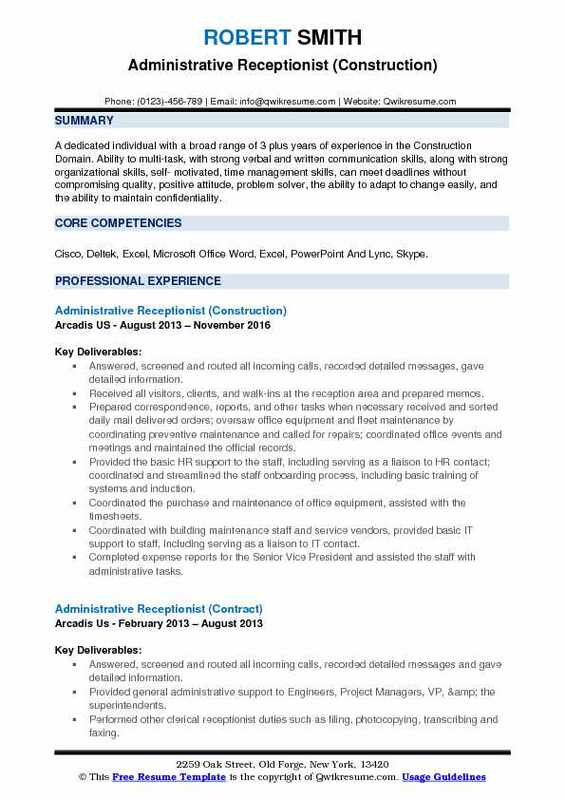 Summary : Administrative Receptionist with 13 combined years of experience in the Healthcare and the Logistics domains is seeking to obtain a career which will allow for both professional and personal growth, while fully utilizing my sales, customer service, administration, supervisory, and public relations background. Processed the weekly payroll for 280 direct hire and temporary employees using ADP time and attendance and manual adjustments, verified the changes and totals. Transitioned the company through a payroll system change and a 40% increase in employees (ADP etime to ADP time & attendance). Coached the employees regarding vacation, PTO, etc. to ensure compliance with the company policy. Provided HR support, prepared documentation of employee transfers, status changes, pay rate adjustments, address changes, etc. and maintained confidential HR files. Maintained all office, copier, fax machine supplies and conference room schedules. Answered telephones, processed mail and courteously assisted clients and employees. Volunteered the wellness committee, fitness incentive program and employee handbook committee. Ordered the company supplies, sent out mail as well as FedEx and UPS packages for employees and managers. Coordinated company events with venues and advised staff of the pertinent details. Summary : Administrative Receptionist with 10 years of experience in the Education domain is looking for a reputable company where I could provide office services by implementing administrative systems, procedures, and policies, and monitoring administrative projects. Continuously answering questions concerning all aspects of daily procedures and operations in a fast-paced environment. Answering the main switchboard and directing all callers to the appropriate parties. Directing and scheduling the visitor itineraries within the established policy and safety protocol. Assisting with secretarial duties daily e.g. Announcements, early student dismissals, arranging meetings between parents and administrators/staff, emergency management etc. Displayed ability to immediately fill in and perform effectively in various staff positions. Assisting and providing care for the ill students within the nurse care unit. Checking students for class/workshop/etc through a software system. Building customer lists in Microsoft Excel and Google docs for receivable management, corporate gifts, marketing, etc. Tracking and compiling the receipts to code credit card statements for cost analysis purposes. 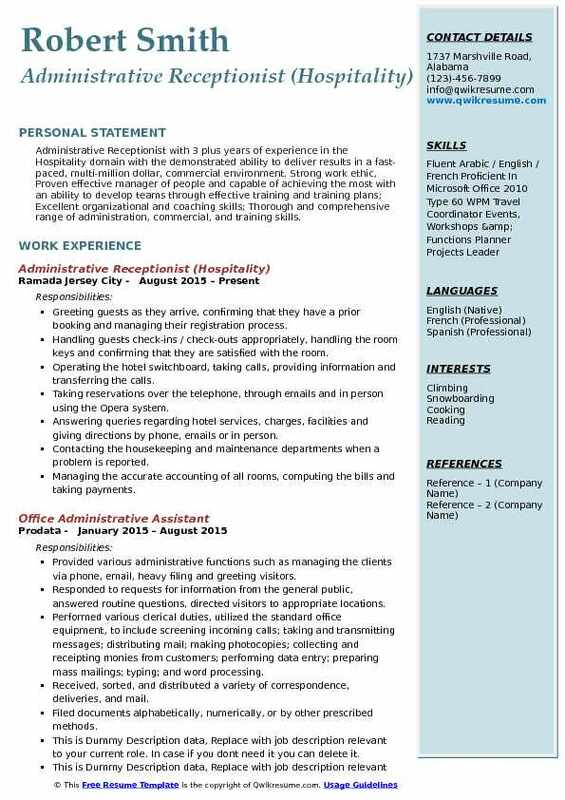 Objective : Highly motivated Junior Administrative Receptionist with 3 plus years of experience in the Educational and IT services domains, is seeking a position to fully utilize my skills, especially in an environment where I can help and assist others in achieving common goals. Acted as the first point of contact for a fortune 500 company. Answered and directed calls and visitors in a professional manner while maintaining highly sensitive and confidential information. Ensured all visitors are comfortable and all needs are met in order to conduct business in the office. Provided administrative support to the Assistant, to the Chairman, assisted with the travel arrangements. Reconciled invoices and expense reports for processing and payment, processed incoming and outgoing mail and correspondence including overnight deliveries, coordinated appointments. Ordered supplies for the office while establishing and maintaining good working relationships with the outside vendors. Acted as a liaison between the building engineers and property manager regarding security and maintenance. Verified with accounting that signing subcontracts/purchase orders, insurance and bonds have been received for each vendor prior to payments being released. 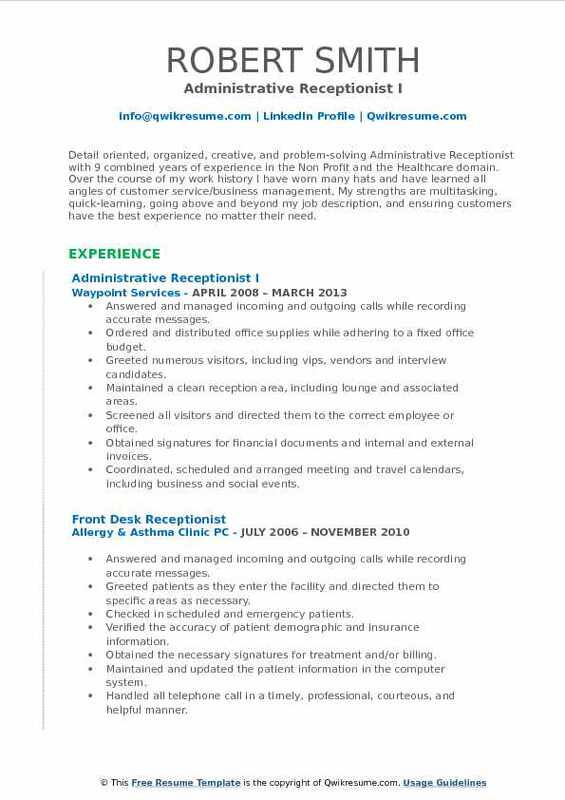 Objective : Administrative/Receptionist with 2 years of experience in the Medical domain is seeking a receptionist/clerical position within the tri-cities area. Scheduled appointments following individual providers guidelines, referring calls through telephone encounter in EMR system to nursing staff or providers as necessary, including appointments for urgent/emergent patients to be seen the same day. Prepared the cart for next day. Distributed the patient satisfaction survey questionnaire. Registered same day add-on patients. 80% accuracy rate. Verified all types and insurance to confirm they are active for patients to get seen before assigned physical therapy appointments. Assisted in the maintenance of schedule shifts & coverage for the reception staff. Handled the tasks of greeting visitors/customers in a friendly and courteous manner. Summary : A goal driven, highly organized, committed Administrative Receptionist professional with 14 plus years of experience in the Finance domain, with a strong work ethic. I am eager to work under strict deadline schedules, producing quick yet accurate work. Motivated, reliable, fast learner, who pays extreme attention to detail, and would consistently deliver top quality assignments along with excellent customer satisfaction skills. Answered the multi-line switchboard and directed calls, greeted the visitors and advised appropriate staff or partner of arrival. Built a rapport with old and new clients as the first point of contact for the office. Processed client payments for daily deposit using check processing machine, sent deposit information via computer and notifying accounting of payments. Maintained and updated organizational charts, distribution lists, and seating assignments. Maintained and updated conference room schedule, as well as ordered catered meals for conferences. Processed all ups and FedEx packages on their software ensuring software was kept up to date. Aided in the tracking of purchases, job accounts, and the cost coding of all job invoices. Followed-up on purchase orders, subcontracts, and amendments to ensure they are fully executed and returned in a timely fashion. Opened mail and sorted invoices for accounting, date stamped and filed by vendor code. Objective : Administrative professional with technical and practical experience, ability to draft professional legal business documents, with proven corporate communication skills with top companies. Assisted the administrative assistants in planning and preparing conferences, meetings and telephone conferences. Scheduled and coordinated meetings, interviews, appointments, events and other similar activities for supervisors, which also included travel and lodging arrangements. Built high-quality office operations by organizing and managing services while communicating with guests/visitors. Developed an office manual for the University high school receptionists/administrative assistants outlining all proper office-wide policies. Operated desktop computer to compose and edit correspondence and memoranda from dictation, verbal direction and from knowledge of established policies. Arranged the travel plans and itineraries, compiled the documents for travel-related meetings. Supported the outside Sales Team on travel, meeting coordination and general needs. Distributed the visitor ID badges according to the company policy. Dispensed temporary team member badges and updated/reconciled the badge logs. Summary : Administrative Receptionist with 11 combined years of experience in the Healthcare and Social Service domains is seeking to obtain a position that will utilize my detail-oriented skills, expand my potential and offer an opportunity for professional experience. Currently handle multiple phone lines, taking messages, and transferring calls. Responsible for keeping track of all purchases, and preparing documents for accounting. Performed several of clerical duties, and was constantly multi-tasking. Was responsible for handling and tracking some the donations and distributing them amongst the programs. Handled unexpected time-sensitive projects in a quick and sufficient manner. Manages incoming and outgoing mail and distributes to appropriate slots. Keeps mail slots up to date. Handled mailbox and desk keys distribution and kept log up to date. Maintained and posted daily conference room reservation schedules. Supported the filing systems, and other clerical functions. Composed and prepared routine correspondence, letters, memoranda, applications, reports and other documents. Collated, bound, and stored the computer-generated reports. Transcribed tapes and/or notes from meetings into a prescribed format. 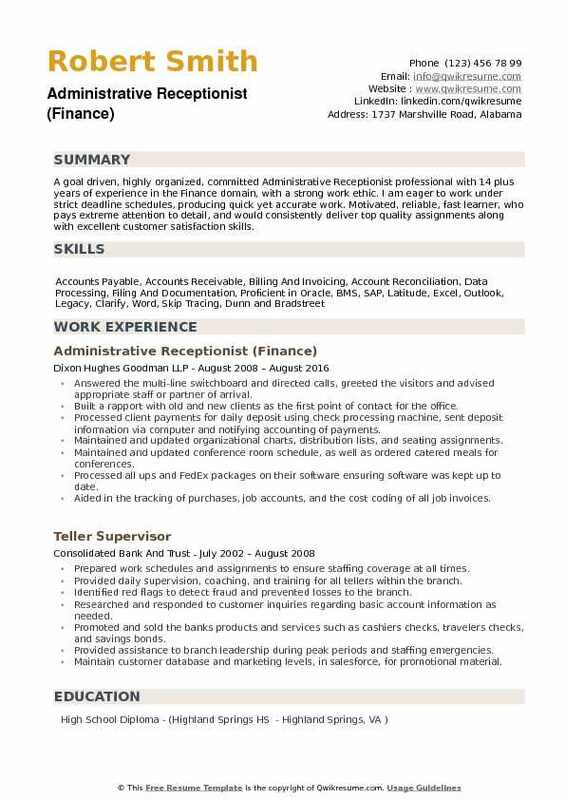 Summary : Administrative Receptionist with 20 plus years of experience in the Law firm is passionate about maximizing adult learning, creativity and human contribution in changing workplaces with proven ability to inspire collaborative learning, accelerate business change and breathe new life across a variety of disciplines. A keen ability to sense what is emerging, to quickly learn into the future, and leverage emerging social technologies with human systems. 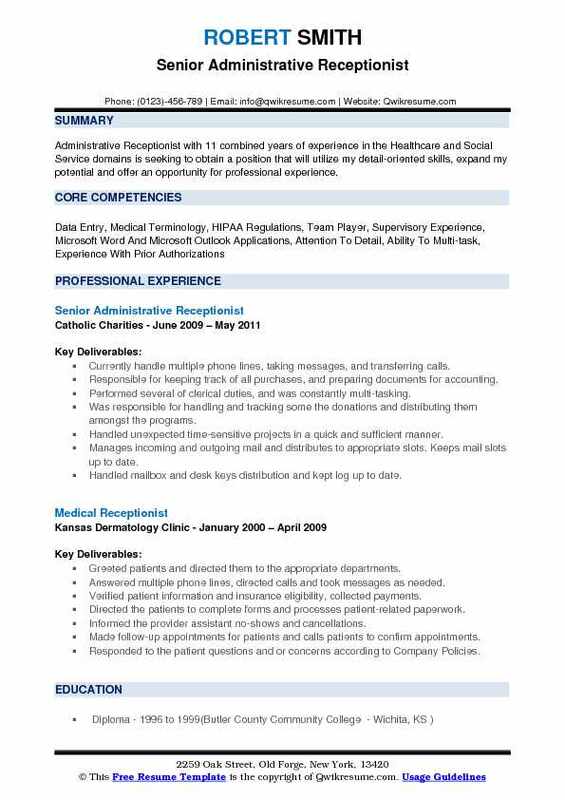 Skills : Microsoft Word, Outlook Typing - 80 Wpm Word Perfect Scheduler/Appointment Setting, Meridian Multi-line Phone Systems. Managing the multi-line phone system, determining the purpose of the call and forward call to the appropriate personnel. Supplying the caller with office address and directions, employee email addresses, phone extension and fax numbers. Greeting on-site visitors and announcing guests. Performing clerical, database and word processing projects for numerous departments. Administrative responsibility of ordering lunches, scheduling conference rooms, database management for attorneys court. Engaging in all offered training, consultations, and supervisions made available. Fully and professionally responding to and implementing directives and advice offered by all supervisory and training personnel, as well as professionally offered feedback from coworkers. Taking all outgoing mail to institutional outgoing mailboxes and retrieves incoming mail from Center mailbox. Keeping office tidy, answering and transferring calls to the specific person or department. Summary : Administrative Receptionist with 15 years of experience with excellent communication, strong leadership abilities, quick to learn and put information to use. Accepts heavy responsibility and shows attention to detail. Handles pressure well and can adapt to shifting priorities. Willing to give extra effort to get the job done. Responsible for answering, screening, and forwarding calls to appropriate staff. Makes phone calls to clients to follow up appointments and provide agency information. Providing pertinent information about the Agency profile and activities. Assistance with office memos, inventory lists, type, print or copy documents. 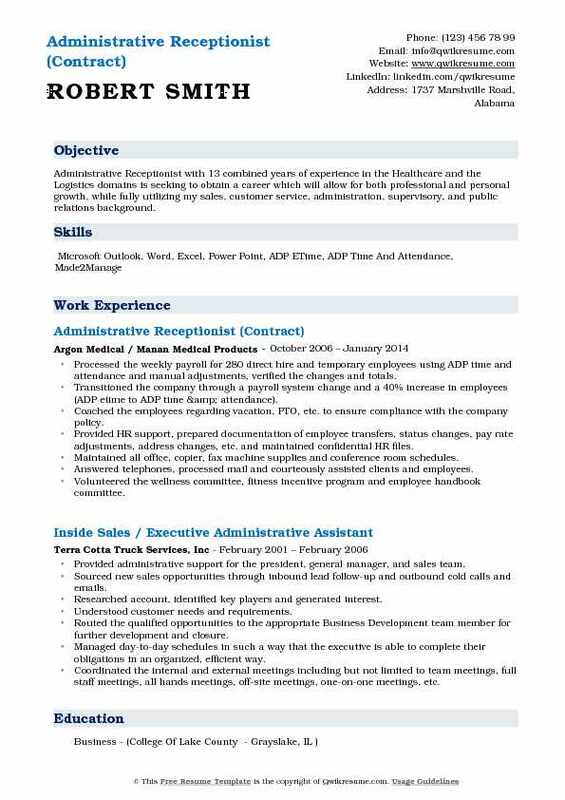 Maintaining confidentiality of incoming candidates data and existing employee data. Maintaining the job site time logs and convert them to employee time sheets upon completion of each pay period. Completing daily tasks that are to be completed within specific time limits. Greeting guests/answer phones, assist accounting with the filing of vendor invoices, preparing them for twice a week check runs. Checking mailing address (on all vendor checks), to ensure payments are sent to the correct place. Opening all mail, prioritizing and distributing to appropriate department(s). Creating and overseeing the office filing system for accessibility, confidentiality, and efficient record keeping. 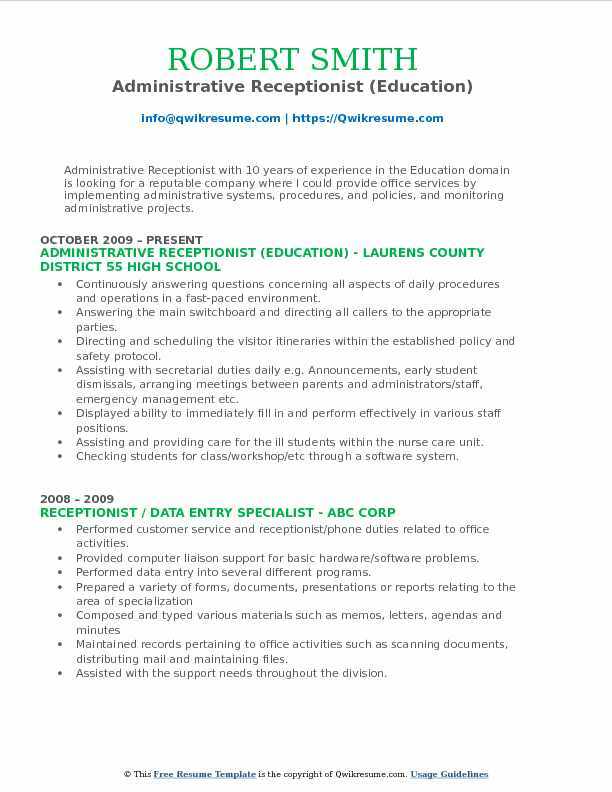 Objective : Administrative Receptionist with 8 plus years of experience in the manufacturing domain, continually maintains a positive attitude while interacting with demanding clients. I am a valuable contribution as I take my position seriously, and a hard worker and I am confident that I will be an asset to your company. Skills : Administration, Creative In Decor And To Think-on-your-feet, Planning And Organization To Execute Events, Personable Communicator With An Aggressive Work Ethic. Clerical/administrative tasks such as filing, logging all incoming and outgoing phone calls, faxes, payments, and contracts. Accountable for providing knowledgeable responses to information requested by clients. Assisted superior in any preparation that was necessary at that very moment. Entrusted to manage office during superiors absence. Assisted in strategic planning, handled itineraries, travel arrangements, re-ordering supplies, and scheduling presentations and conferences. Opened and shut-down office, answered and screened the incoming calls, taking and distribute messages, meeting and greeting all visitors and guests. Scheduling the conference room, maintaining a neat and welcoming appearance of reception area. Performing copying, printing, mailing, filing, faxing, scanning and typing as required. Opening and distributing incoming and outgoing mail and faxes, ship and receive courier packages - domestic and international. Composing routine correspondence, set-up and maintaining files, accepting and distributing lunch deliveries to employees. 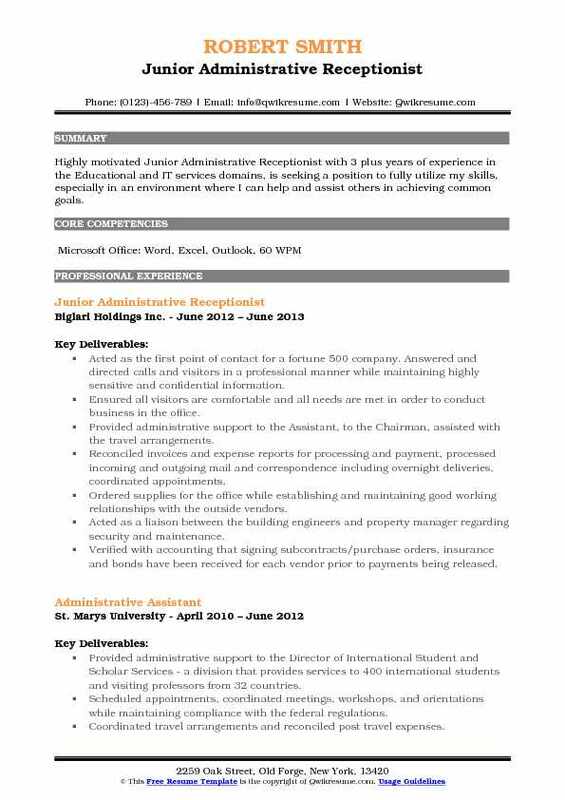 Assisted office manager in coordination of office services. i.e. , housekeeping, purchasing office supplies, ordering catering when needed. Maintained office equipment, i.e. , fax machines, printers, photocopy machine, postage machine and telephone system.